Our money was rapidly running out as we continued preparing for the inevitable day, when having talked the talk and walked the walk we would have to set sail, swapping this little haven of security for the great unknown. A day neither Lyn nor I had directly mentioned to each other since we had first moved to the Travisome Guesthouse, a day when we knew we must shatter this cosy existence and do what we had told the children we were here to do. We both knew that this day, when it arrived, would be the day when it would no longer be possible to change our minds. Slowly and inexorably, the pressure between us began to build. One night in December Lyn told me that she was no longer prepared to risk the children's lives or indeed jeopardise our own futures, as far as she was concerned the trip was over and Lucette must be sold! In a single stroke, Lyn had put an end to our new life and an end to our collective dreams of a great adventure. I felt numb and almost paralysed with anger, as my world turned to a panic stricken blur. In a daze I reached out, more in frustrated desperation than intending a physical attack and was snapped back to reality by the sound of a stifled scream, finding to my horror that my hands were not only tightly gripped around Lyn's neck but that Neil, visibly shaking with fright was watching from the companion way door. I snatched my hands away and apologized to Lyn, glancing quickly back to the companionway door but Neil had already disappeared. Like a beaten, conquered animal I slumped onto the nearby settee, exhausted by the stress of the situation I was left gulping for air, struggling to control myself, still shocked and frightened at the monster I had become. Lyn now silently pensive kept her distance, watching me incredulously. I felt uncomfortable under her fitful stare and without saying a word made my way up the companionway steps, cooling off in the fresh air of Lucette's teak laid decks. Clinging to the shrouds I gazed across at the busy ship repair yards full of freighters and tankers resting like sleeping giants, lit up by intermittent flashes of welding and high speed grinding discs as the cranes and tugboats busied themselves in attendance. Lyn was right, it was a foolhardy idea, Lucette must be sold and I would return to the sea as a professional seafarer, with the sales proceeds Lyn and the kids could set up home, maybe even here in Falmouth and I would send money home to support them. I voiced my thoughts aloud trying to convince myself that it was the right thing to do, indeed the only option left. I had not enjoyed my previous spell of fourteen years at sea; the painful memories aside I had made a success of my career but the prospect of another fifteen years seemed daunting. I was suddenly aware of a pair of arms slipping around my waist and looking down I beheld my eldest son Douglas, tears streaming down his cheeks. "Please dad", he sobbed " Please take us with you round the world". Turning his head sideways he buried his contorted face into my chest struggling to fight back his tears, I hugged him to me in silence, unable to speak about the adventure we had once planned and discussed almost non-stop for the last two years. I stared away to the silvery sea, it seemed to be mocking me, challenging me, indeed calling me and yet it may as well have been on another planet. With the farm sold and almost all our surplus funds invested in the Lucette, calling off the voyage now was going to be very damaging indeed, both psychologically and financially. The shipyard siren interrupted my thoughts blasting out across the water, signalling the end of the afternoon shift. Like teams of ants, men began to stream down the gangways hurrying off to their homes with indecent haste. Involuntarily I glanced at my watch as if to confirm the siren's compliance, then Anne's voice broke the wretched silence. " Now come on you two", she spoke assertively as she directed the twins onto the Zodiac dinghy moored alongside, "you too Douglas", she added. "It's Mum and Dad's turn to do the watch onboard tonight, and my turn to make the tea". 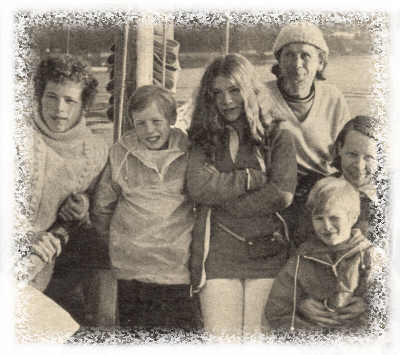 I failed to register the urgency in her voice or notice the speed with which she organised the boys, chiding them into the boat alongside, before I knew it I was waving goodnight to them, as they pulled away from the side bound for Flushing pier. I watched them recede into the distance, Neil still bailing the water from the bilge and pouring it over the side in a manner that particularly irritated me. The dingy leaked badly both air and water and I couldn't afford to have it repaired. I shook my head as I recalled the recent memory of Neil tipping the bailer full of water over the engine causing it to cut out and stranding us all in the middle of the bay. If I hadn't been so intent on focusing on my children's shortcomings perhaps I would have realised just how mature Anne had been in that moment, far wiser than either of her parents in realising that Lyn and I needed time together alone, to discuss all that had happened and work things out for the future. Indeed had I stopped to consider what she had just done, maybe I would have had to face up to the fact that the reason why I had been insisting that such a trip was necessary for the education of my children, was less true than that I really wanted to do the trip for myself! With a heavy heart I turned from the shore and descended the stairway to the saloon below. Lyn had already wiped the tears from her face but the finger marks where I had gripped her neck, stood out starkly against her smooth white skin. Her neck and face still carried childhood scars from a burn she had suffered at the tender age of eight. Life with me had not been easy for her, I knew she loved me, even after what I had done to her but I also had to accept that she had the right to say what she thought, without the fear of bullying or recrimination on my part. I repeated my apology and reached out my arm as if to shake her by the hand. It seemed oddly appropriate and Lyn, showing understanding and forgiveness that only true love can show, took my hand in hers and with yet more tears filling her already reddened eyes, pulled her self to me. "You know Lyn", I began " I haven't been the best of fathers to the children, they have had it tough". I stopped for a moment searching for the words that would make my point. "Our farming enterprise had been like a long dark night of the soul for me, what with no electricity or hot water on the farm, no television and mostly second hand clothes for the kids to wear, with never a complaint from them and you know what? The other day Dougie was standing on the pier, cold and wet from the rain and he asked me if I would buy him a coat. Do you know what I said? Do you? I told him to wait until we got into a warmer climate where he wouldn't need one". I continued my unblinking stare in Lyn's direction; she was still listening intently so I continued. "I was pathetic Lyn, bloody pathetic, I had no bloody money left so I made my own son shiver in the wet and cold and do without". "Life has always been a struggle", Lyn spoke quietly, nodding for me to continue, "Lyn, I've learned that sometimes life gives you a second chance and with your help I mean to take it! I was never able to give our children the trappings of life but I can give them what most fathers can't". Lyn said nothing so I pressed my point home in an impassioned, all or nothing plea straight from the bottom of my heart. "I had a dream Lyn, a dream that kept me going through those bleak, harsh days of farming at Meadows Farm. I had the dream that some day, I would pay my children back for all those cold nights and empty dinner tables, the holidays they never had and the days when we sent them to school in shoes that didn't fit. I want to share what is left of their childhood while they still have it, I want to give them my time before its too late, and I still have that dream Lyn. Please don't send me back to sea, please think on and see if we can still perhaps give the children something they will remember forever, something really special, something that even a millionaire couldn't give to his kids; the adventure of a lifetime. Let me have that second chance Lyn, let me live that dream, give me two years, Just two….". I held my two fingers right in front of her face, pleading desperately whilst searching her eyes for the smallest hint of a u-turn, or the slightest glimmer that might give me hope. The future course of our lives depended on the outcome of this moment "I'm so sorry" she choked "I've been such a silly woman, I'm just breaking our family apart…who the hell am I if I don't support you… ". She paused and the silence became unbearable "I want to go Dougal, I want to go with you and the children. I want you to take us all with you and sail around the world", her voice was thick with emotion and trembling as she fought back another onset of tears, now it was my turn to break. Rarely given to shows of emotion, I could not stop the tears welling up inside me as bound in each other's embrace, we sat in silence, words no longer necessary, the sounds of the sea interrupted only by the rhythmic creak of Lucette's rigging, which echoed reassuringly in our ears. Another hour passed and it had already turned dark before Lyn finally broke the spell, by suggesting a cup of tea and something to eat. "I wonder what the children are having for tea", she mumbled almost beneath her breath, a concerned frown flitting across her face but that night was to be for Lyn and I alone. We settled down in the shadowy glimmer of the paraffin saloon lamps and talked of our future together as together, we prepared and ate a simple meal. We made a secret pact agreeing to put two years aside for the trip and if after that we had not completed the trip, we would either return to England or settle in New Zealand or Australia and start a new life there. That night we shared an intimacy that had been all too rare in our life together. Hard labour and lack of money were not and had never been, the ingredients for romance and as if marking the change in life's course, we bathed in the glow of a deep and genuine happiness for the first time in a long time. Our slumbers were broken early next morning by the sound of children's voices hailing us from the dinghy. Lyn rushed up on deck driven by her motherly instinct and parental concern, her face breaking into a broad smile as she took the rope from Sandy's outstretched arm. 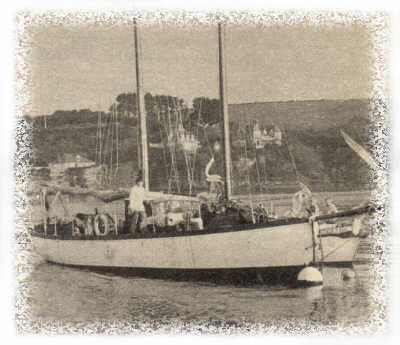 Douglas cut the motor and gripping L ucette's gunnels manoeuvred the dinghy to the boarding ladder, with the expertise of an old seadog. The pensive look on their faces turned to joy, as they realised that Lyn and I had made things up between us and that the trip was most definitely on once more. Anne and Douglas exchanged a knowing look as they explained to us they had been up all night, discussing if we would be going or not and what the alternatives might then be. Anne told us that they had decided that if we were smiling as we greeted them in the morning then the trip was on and if not then no matter how we couched it, the trip would be off, and in no way would they be prepared to return to Staffordshire. The thought of putting our children through such a night left both Lyn and I feeling guiltier than ever, our children were growing up by the day and we couldn’t even see it.